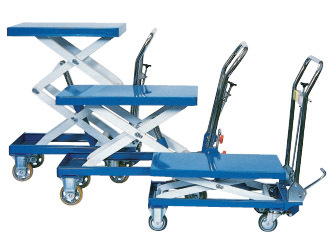 Lifter Trolleys are the safe and versatile way to transport loads in warehouses, workshops, loading docks, hospitals, libraries, assembly lines, offices and nurseries. Raising heavy loads with the use of hydraulics, helps reduce workplace rated injuries. Available in sizes from150kg up to 800kg. Single and double scissor lift models for high reach. Overload value ensures load limit is not exceeded. Handle folds flat for storage on 150kg and 300kg models.